Good Day everyone! The Fireflies would like to thank everyone that came out on November 3rd. We really appreciate your support of our group and to our fellow artisans. We hope you continue to shop local and handmade for the holidays. Darlene Storgeoff – Handmade Glass Beads will also be doing a sale this Saturday out in Devon. We are now less than a week away from our annual fall sale! Come for a visit and pick up something lovely for that someone special in your life. Don’t forget to treat yourself as well. 🙂 Click the here to be taken to our Facebook event page. It’s official, fall is here! Time for our annual Fall Sale! Hi everyone! Hope you all had a summer full of fun, and laughter. The fireflies have been busy this year, working on new beads, taking classes, and spreading the handmade lampwork bead love. We have one more weekend at the St. Albert Farmers Market this weekend, so if you’re in the area come check it out! I know you’ll love some of the wonderful Halloween themed beads Kyra has been working on. 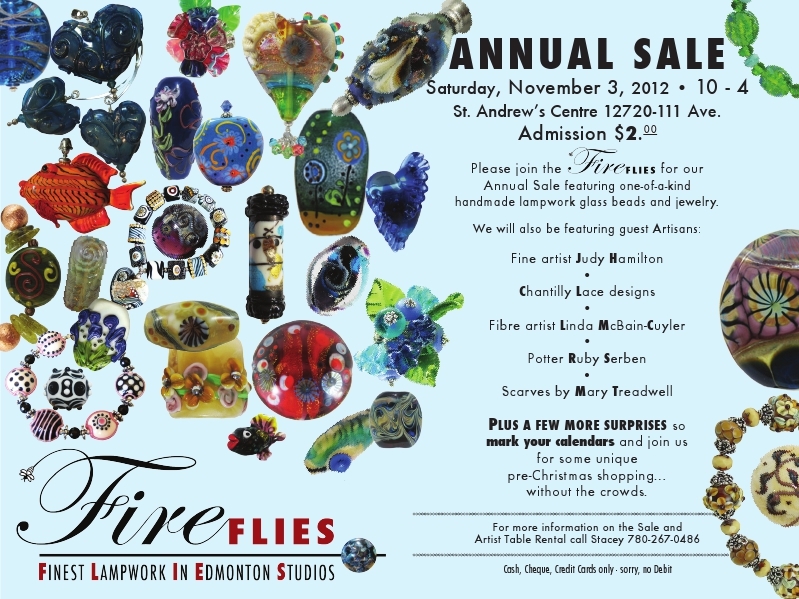 Since Fall is here, we also have an exciting event coming up November 3rd, our Annual Fall Sale! Love the bold color and perfect details in this wonderful glass fish by Darlene Storgeoff. Be sure and “LIKE” Darlene on Facebook! Carrie of The Bead Tree is getting ready for a sale on June 2nd. This is just a small example of her beautiful bead style. Be sure and visit her site for more photos of her work, and info on upcoming events for The Bead Tree.